Note: Teemu Pulkkinen has been called up from Grand Rapids to replace Johan Franzen who has been placed on the IR. Gustav Nyquist has heated up lately by putting up nine points (1G, 8A) over his past seven games. Fans may be alarmed that he has only potted one goal during his streak, or that it’s his only goal in his past ten games, but his eight assists show that he has been sharing the puck. Best known for his highlight reel goals, puck control and persistence, Nyquist could disappointingly count his assists on one hand through the team’s first 34 games this season, with five. Now, with eight over the past seven games, he has totaled 13 assists and began producing more than goals for his team. Playing regularly on a line with Henrik Zetterberg, Nyquist has helped the captain to find the back of the net once again, tallying five goals over his past ten games and bringing his total to ten goals on the season; joining teammates Pavel Datsyuk, Tomas Tatar, Justin Abdelkader and Nyquist for double digit goals. Detroit now has five players with ten or more goals, only seven other teams in the NHL have five players that have tallied double digits thus far, Washington leads the way with six. After leaving the Olympics early last year with a nagging back problem, Henrik Zetterberg had surgery to remove a herniated disk that was rubbing against a nerve. While walking like Frankenstein during Nicklas Lidstrom’s retirement ceremony at Joe Louis Arena, fans were worried Zetterberg was done for the year. He returned during the playoffs to play two games against Boston before being eliminated. Even with two points (1G, 1A) in those games, Zetterberg was clearly still not 100%, as appeared to be skating with a corset underneath his equipment. 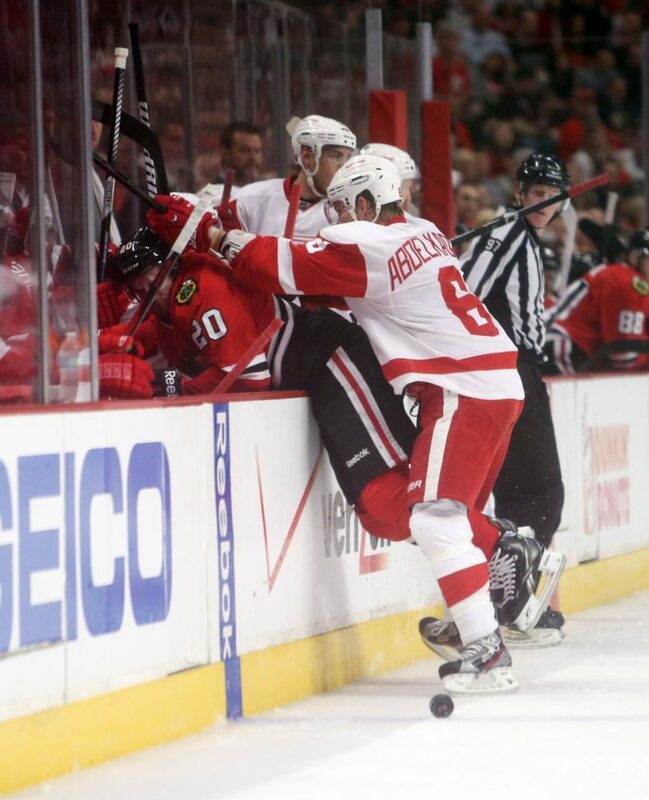 Fully healthy and back in shape to start the season, Zetterberg went right to work to pick up where he left off. This season though, Detroit had replaced veterans Daniel Alfredsson, Todd Bertuzzi, Mikael Samuelsson and David Legwand with youngsters Gustav Nyquist, Tomas Tatar, Riley Sheahan and Tomas Jurco. The captain brought the team together and Detroit is in its best contending days since Lidstrom manned the blue line. The third member on the line of Hank and Gus, Abby’s new found scoring touch has made him the hottest Wing recently, with seven points (4G, 3A) in his last six games, three of which coming on the powerplay. His net presence has virtually replaced Tomas Holmstrom and he does the heavy lifting when given an opportunity next to Datsyuk or Zetterberg. He may not keep it up, but halfway through the year, he has already reached a new career-high for goals in a season. One thing is for sure, if the points slow down, his intimidating presence and hard-nose play certainly won’t. The Magic Man has scored 30 points (14G, 16A) in as many games this year with seven in his last eight contests. He is healthy once again and proves (alongside Jaromir Jagr and Martin Brodeur) that age doesn’t have to slow you down. At 36, Datsyuk continues to display his fantastic hockey sense and Datsyukian dekes on a regular basis and remains one of the best players in the game. It’s clear that Detroit is a different team when he is on the ice; Stephen Weiss would agree after finding a scoring touch for the first time as a Red Wing while playing on a line with Datsyuk. The truth is that Datsyuk isn’t the kid he was playing next to Brett Hull in 2002, but he has had a fantastic career and has no reason to hang up the skates just yet. He still produces elite numbers and contributes to his team both on the ice and in the locker room every game. Through 41 games played this season, the Detroit Red Wings are tied for the second-fewest regulation losses with the Pittsburgh Penguins (40 GP) and Anaheim Ducks (42 GP). The Nashville Predators (39 GP) lead the pack with only nine regulation losses. The underlying theme is the Wings’ poor performance during overtime and the highly debated skills competition called the shootout, in which Detroit has sole possession of last place with a dreadful 1-7 record. Combining overtime and shootout losses; which place them dead last in that category, as well; Detroit is tied with the Florida Panthers, Los Angeles Kings and the Edmonton Oilers. At the expense of Johan Franzen and with the status of Tomas Jurco currently up in the air, the team has called up Teemu Pulkkinen. 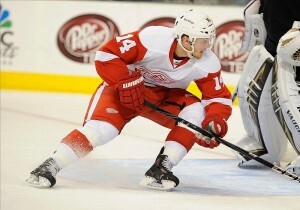 Fans could see his right-handed shot quickly contribute to the scoresheet and help the Wings in their second-half. Halfway through the year, and two wins in a row, Detroit has displayed the bright future ahead of them, even without bringing in that top-four defenseman fans and analysts expected. If Detroit can build on their 53 points through 41 games, they will be a lock for the playoffs and should put up a better fight than last season against Boston. The Wings have certainly built on last season’s success and the kids will continue to find consistency and gain experience at the game’s highest level of competition. Check out the The Hockey Writers mid-season grades for the Red Wings here. Stats provided by TSN and ESPN.